Both companies agreed to develop and distribute carbon fiber booms for John Deere application equipment in agriculture. The new John Deere R4050i has parts developed by King Agro. Deere & Company has signed a definitive agreement to acquire King Agro, a privately-held manufacturer of carbon fiber technology products with headquarters in Valencia, Spain and a production facility in Campana, Argentina. "This transaction provides John Deere customers the chance to benefit further from King Agro's unique knowledge, designs, and expertise in carbon fiber technology," said John May, President, Agricultural Solutions & Chief Information Officer, at John Deere. 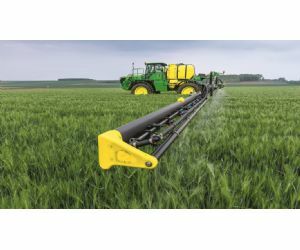 In 2015, John Deere and King Agro agreed to develop and distribute carbon fiber booms for John Deere application equipment in agriculture, offering growers the significant advantages of carbon fiber's versatility, strength and durability in self-propelled spraying equipment. May said the transaction announced today will provide benefits in sharing best practices in product development, manufacturing, technology, as well as in scale as King Agro builds on a history of innovation. King Agro has been a family-owned business with approximately 180 employees and an extensive 30-year history of developing various carbon fiber products. In agriculture, the company has targeted innovative designs that improve productivity and lower costs. King Agro will retain its brand name, trademark, and commercial relationships. Deere & Company is a world leader in providing advanced products and services and is committed to the success of customers whose work is linked to the land - those who cultivate, harvest, transform, enrich and build upon the land to meet the world's dramatically increasing need for food, fuel, shelter and infrastructure. Since 1837, John Deere has delivered innovative products of superior quality built on a tradition of integrity. Why do the loess hills of Iowa need to be farmed in terraces?